South Korean films seem to form the staple of the Midnight Screenings at the Cannes Film Festival, and understandably, considering their directors' mastery of genre cinema, coupled with their formal skills. There has been some fodder over the years though, but not The Villainess, presented this year, oh no, not The Villainess! 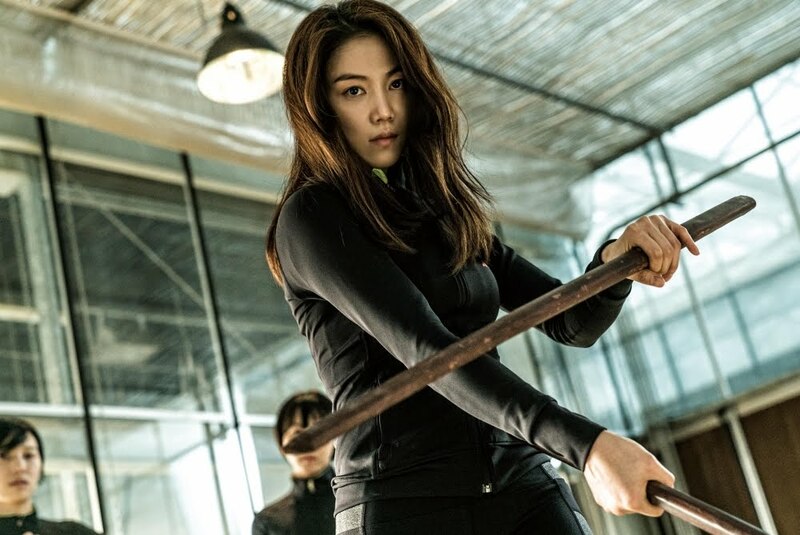 In The Villainess, Sook-hee (Kim Ok-Bin) was trained to become an assassin since childhood. She is brought to the attention of South Korea's Intelligence Agency after a particularly bold act of vengeance, and recruited among their black ops all female team of assassins, with the promise to be sent back to civilian life after ten years of service, and of a better life for the daughter she is soon to give birth to. A man from her past reemerges however, and her loyalty is put to the test. A South Korean film called The Villainess about a female assassin should be music to the ears of all genre film fans. The opening scene, a POV carnage in which Sook-hee dispatches an entire gang with guns and sabres (one of the highlights of the films!) hints at a female The Raid, however the film then basically becomes a South Korean La Femme Nikita, with a dollop of Kill Bill. The script's premise is very similar to the former indeed, with one scene nearly completely lifted from the French classics, all the way to the camera angles. However the film is South Korean through and through! So on the plus side, the film is visually beautiful, with a great sense of colour and framing that so many South Korean directors seem to master. The action scenes are beautifully choreographed, energetic but always very clear, unlike the shaky, confusing mess seen in so many American blockbusters. On top of the aforementioned opening scene, the film features two more breathtaking set pieces, one involving a narrow tunnel and bikers with swords, as well as a fight in a speeding bus. Despite what those scenes might indicate, the film does not go too over the top, and remains mostly within the realm of realism, the realism of genre films that is. There is a bit of schmaltz too however, which drags the proceedings a little in its middle section, during which Sook-hee lives an unexpected romance (although of course, nothing is ever as it seems), while she tries to make as normal a life as she can for her young daughter. This has the merit to give a bit of depth and a certain emotional dimension to Sook-hee at least, who could otherwise have become just a one-note character. The script, while not particularly original, pleasantly follows the well worn trope of the hitman/woman subgenre: the rescue and recruit of a talented, loose cannon by a shadowy organisation, the scheming bosses, the double-crossing and shifting loyalties... It is refreshingly female-centric however, and not just because of the female lead. Her tough female boss Chief Kwon (Seo Hyung-kim), has a steely, emotionless authority, even though she shows her human side too, with the actress giving a memorable performance for a character that could just have been a plot device. Most of the remaining important parts are held by women too, from Sook-hee scheming rival to her less accomplished friend, with males firmly on the supporting side (though they remain key to the plot, even when unseen). It is the Villainess herself (Ok Bin-kim, already noticed in Park Chan-wook's Thirst, and who did most of her numerous stunts herself), who makes the biggest impact however, in a very physical performance which feels effortless, whether she is slicing through baddies or jumping out of windows, but which is far from one-dimensional, her character going through a full emotional arc throughout. The Villainess is one of those genre-tastic films that South Korea does so well, and a perfect exploitation tonic.